No, this isn't a Leslie Knope stress dream: according to a new book about the 2012 Presidential election, some top White House aides thought it would be a good idea to replace Vice President Joe Biden with then-Secretary of State Hillary Clinton as a way to bolster Obama's floundering approval ratings. Imagine what could have been. The new book "Double Down," by Mark Halperin and John Heilemann (the same team that brought you "Game Change" and, by extension, Julianne Moore's fantastic Palin accent), reveals several juicy sounding tidbits from inside the 2012 campaign. Among them, that President Obama really doesn't like Bill Clinton much except in "doses," that the person who told Harry Reid that Mitt Romney like, never pays taxes was Utah billionaire Jon Huntsman, Sr (father of that tolerable dude who ran for President on the GOP ticket), and, most salaciously, that some of Obama's aides thought Clinton's incredibly pre #BENGHAZI popularity would help lift Obama from the approval depths. What kept the radical shakeup from happening were focus groups that determined that Clinton wouldn't help Obama much, approval-wise. At least not enough to piss off Uncle Joe. 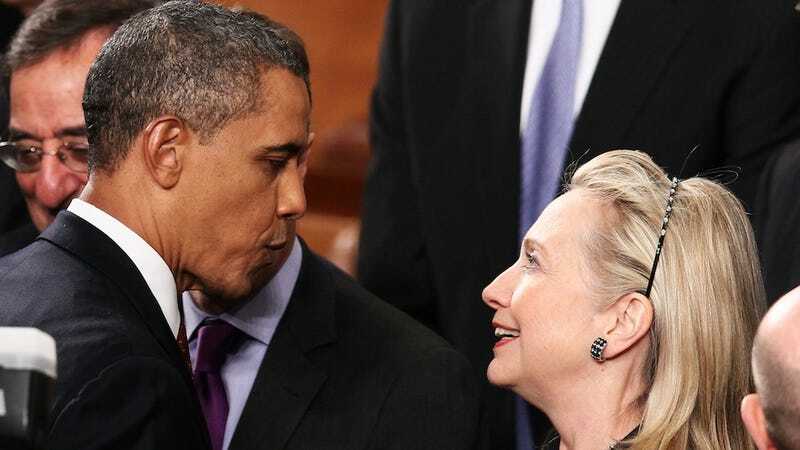 Former senior Obama advisor David Plouffe has already denied that any of this veep switch talk happened, but his party poopery can't take away the fun that comes with picturing what a Clinton vice-presidency would have looked like. Can you imagine Vice President Clinton presiding over the Senate? OBAMA/CLINTON bumper stickers? OBAMA/CLINTON tattoos? OBAMA/CLINTON costumes for interracial wonk couples? So many possibilities.